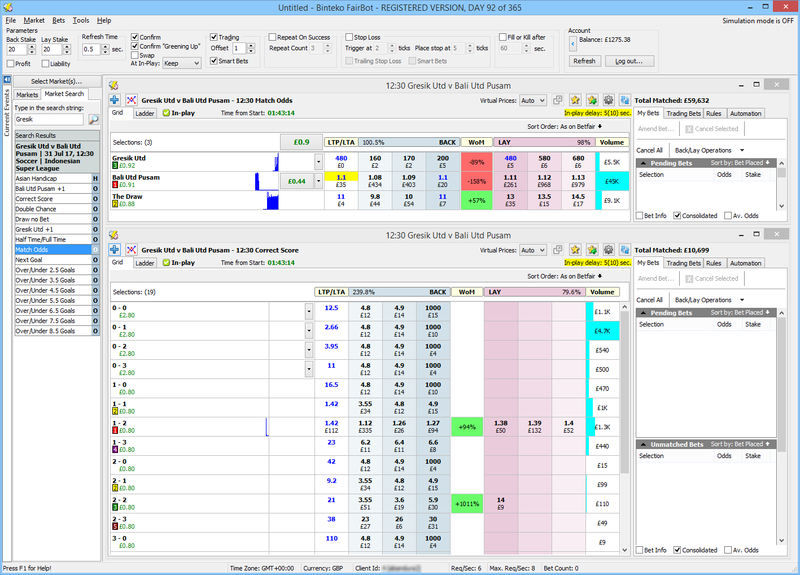 Trading Software for Betfair - FairBot. 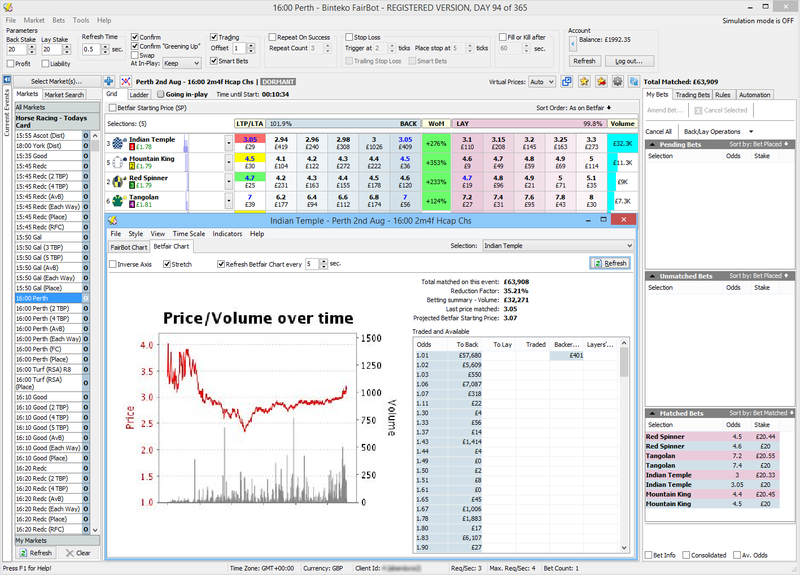 FairBot is innovative software for the betting exchange, Betfair. 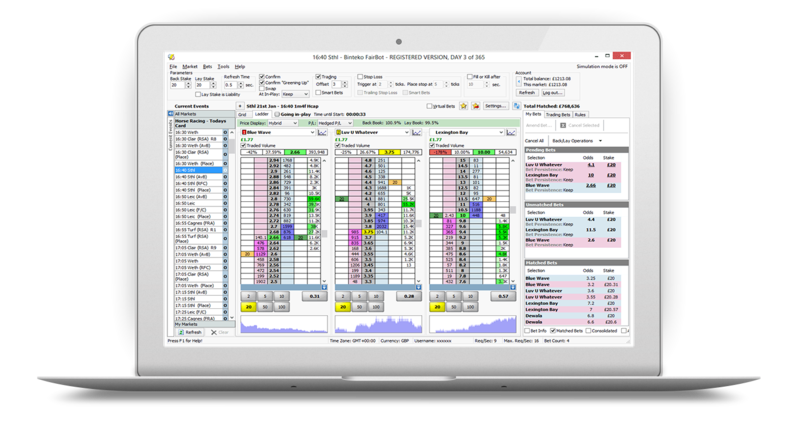 With an intuitively clear user interface and a large set of diverse functions for betting, trading, dutching, etc., FairBot allows you to work with the betting exchange effectively, and to achieve greater profits with less effort. Download and Try FairBot completely FREE for 15 days! 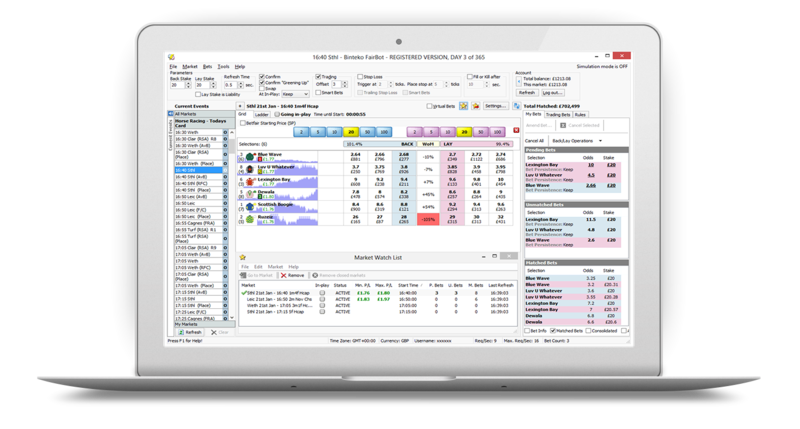 Specify the required number of columns to display the back and lay odds. 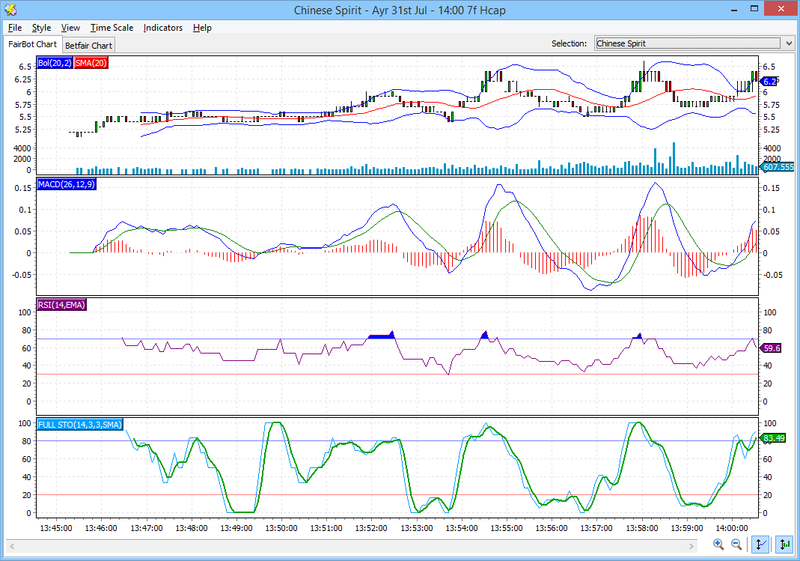 Display the traded volume for each outcome or participant. Show the odds change history. Place bets with a single mouse click. Sort rows according to different criteria. 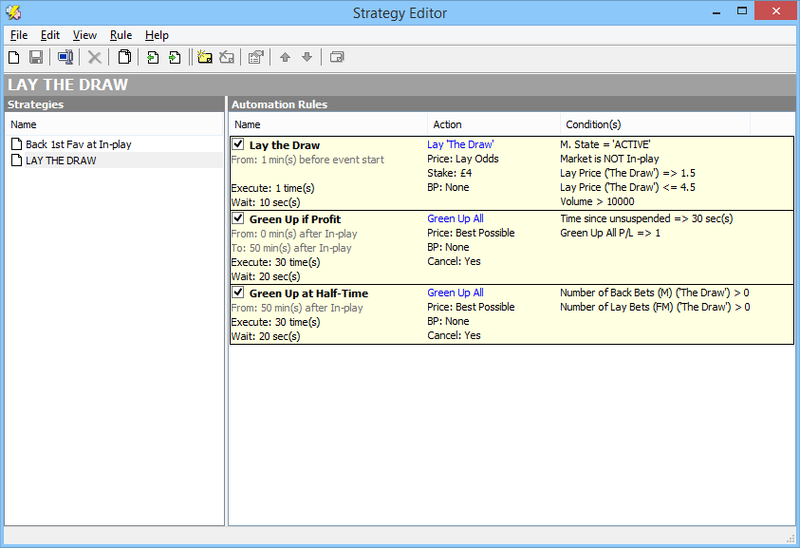 Allows you to place, cancel or modify bets with a single mouse click and drag & drop techniques. 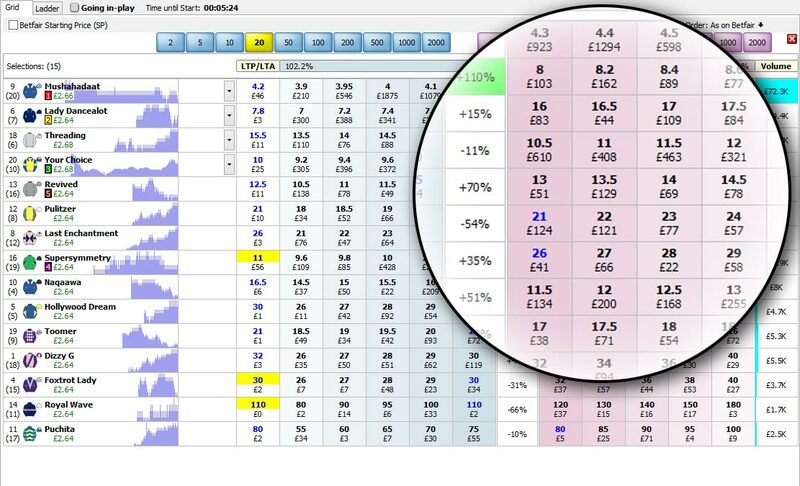 Displays the odds change graph, placing ladder odds on the ordinate scale, that allows you to visualize which odds corresponds to every single point on the graph. 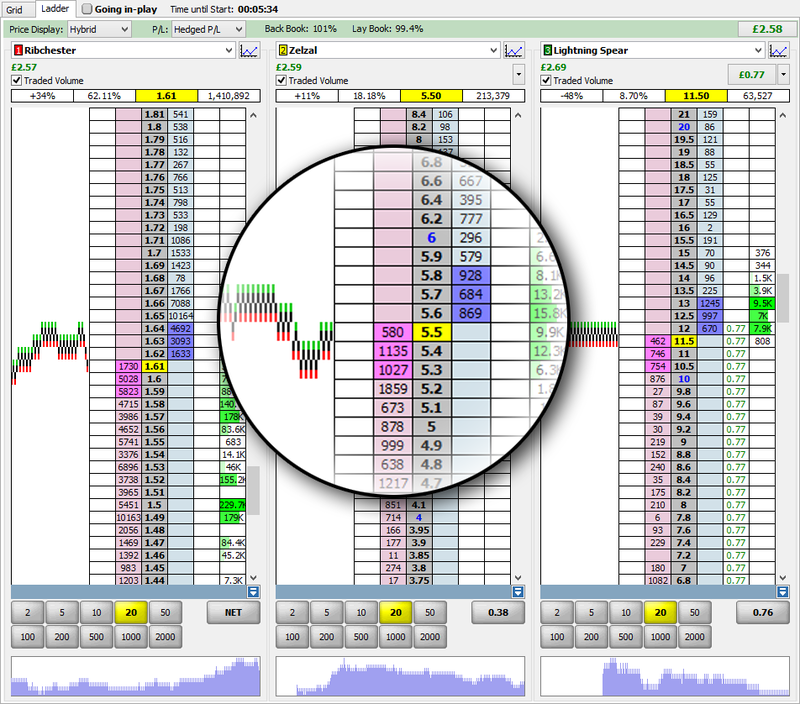 Displays the traded volume for each odds. 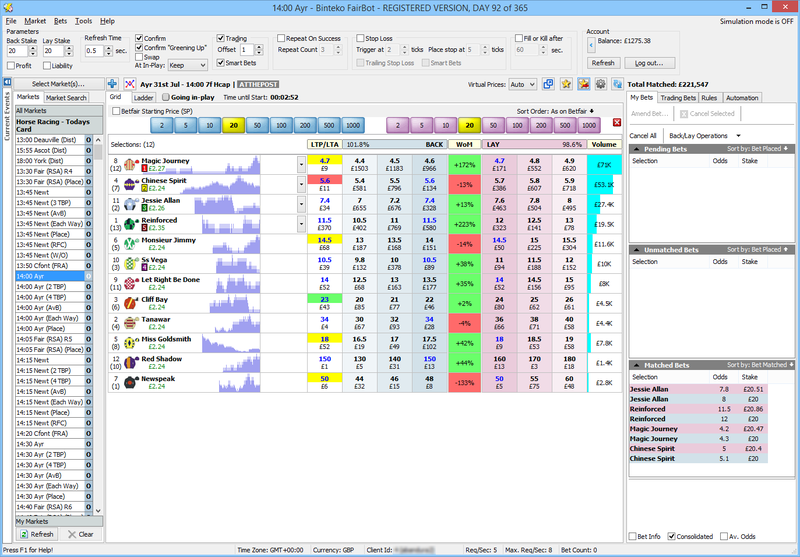 Allows you to change the stake of future bets with a single mouse click, using stake buttons. Hedged-bets - automatically calculates the closing bet for the same profit regardless of the outcome or winning participant. "Repeat on Success" – allows you to automatically repeat a trade (giving the number of times) in the case of a successful closing of the previous trade. "Fill or Kill" - cancels a trade, if the initial bet does not become matched for a predetermined period of time. 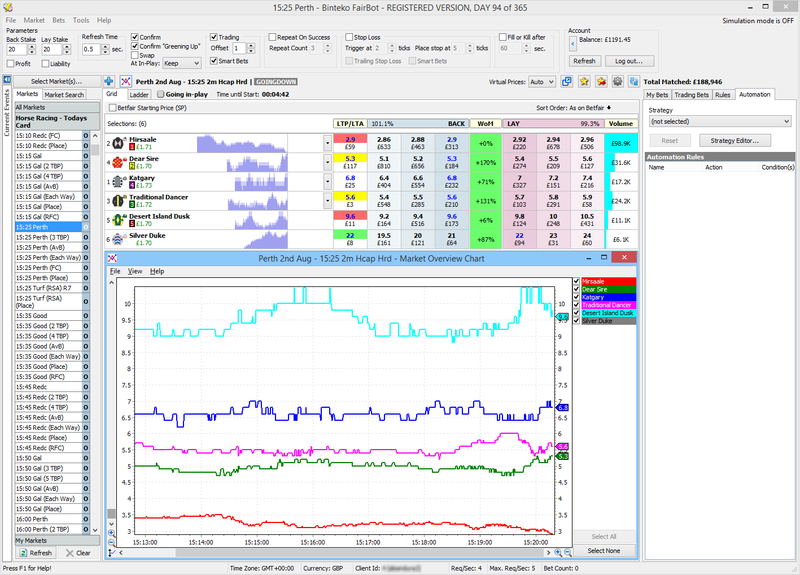 FairBot allows you to display a standard Betfair graph of odds changes, as well as its own graph of odds changes, in real time, making it possible to react quickly to changes in trends. Tired of routine work? Then direct it to FairBot. It allows you to automate key operations, and free-up time for you to do other things. FairBot has no emotions, so it will act strictly in accordance with the prescribed rules and will not fail at a critical moment. Simply define the rules of your strategy, and then assign it to the selected markets; FairBot will do the rest. 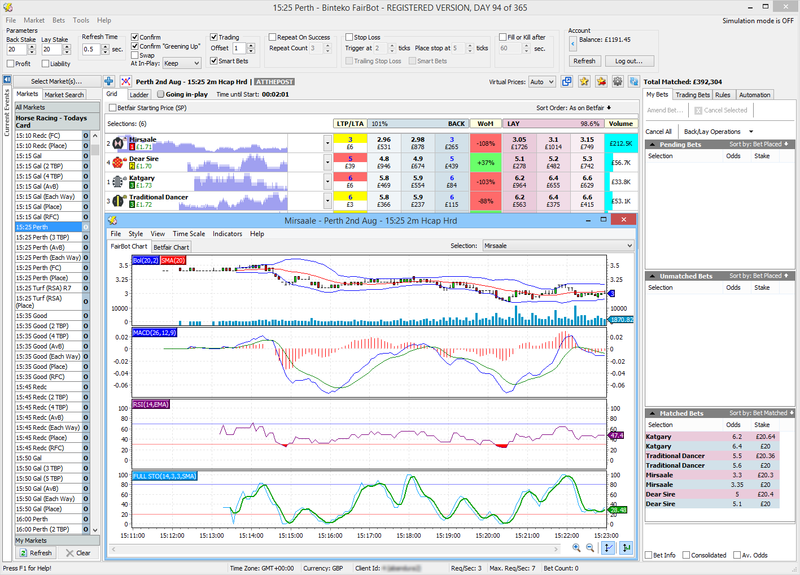 Allows you to use a single mouse click to close opened positions and distribute profit or loss equally between all outcomes. Advanced Cash-out - allows distribution of the profit/loss between the outcomes in any proportion. 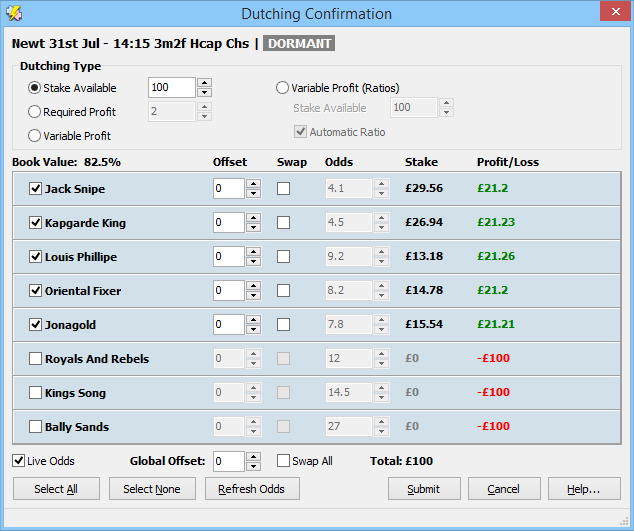 FairBot has an impressive set of tools for Dutching and Bookmaking. With FairBot, it is not only possible to get equal profit on selected outcomes, but also to set it for each selected outcome independently. This enables you to increase the potential profit for the more likely outcomes, and to reduce it for the less probable ones, while maintaining the bank at the same level. 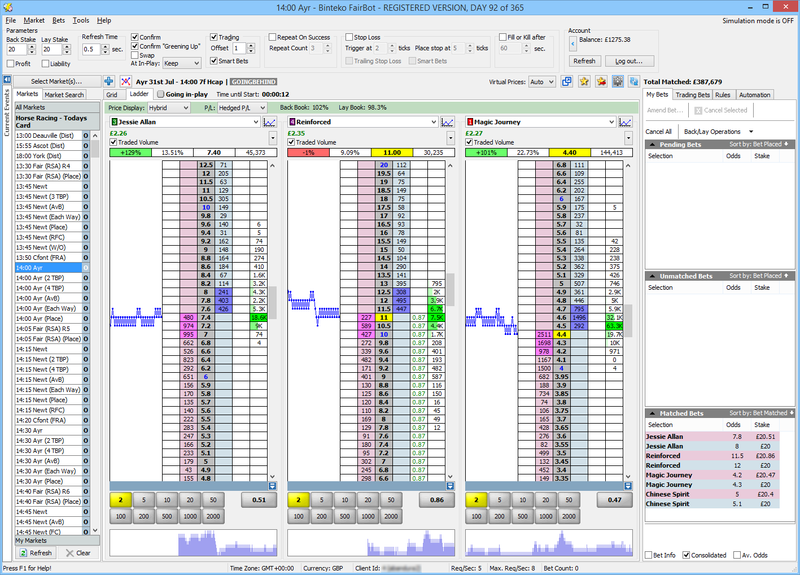 The Simulation Mode allows you to learn various functions of FairBot, or test your own strategies, completely, without risking money in your Betfair account. 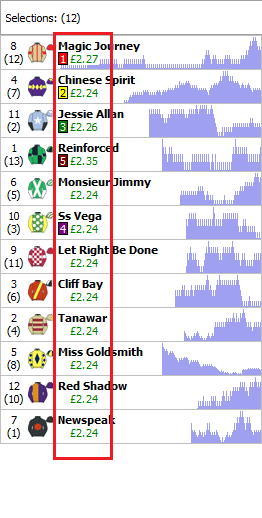 This mode emulates Betfair and allows you to use virtual bets to study FairBot, or to check any new strategy, before you apply it using real money. Update multiple markets simultaneously via the Market Watch List (MWL). To do this, simply add the desired markets to the Market Watch List and FairBot starts updating them while you are working on another market. Don’t want to search for your markets in a complicated market menu tree every time? Then try Faceted Market Search, allowing you to find and select appropriate markets on the basis of predetermined search criteria, such as: sports, country, market start time, market type, etc. 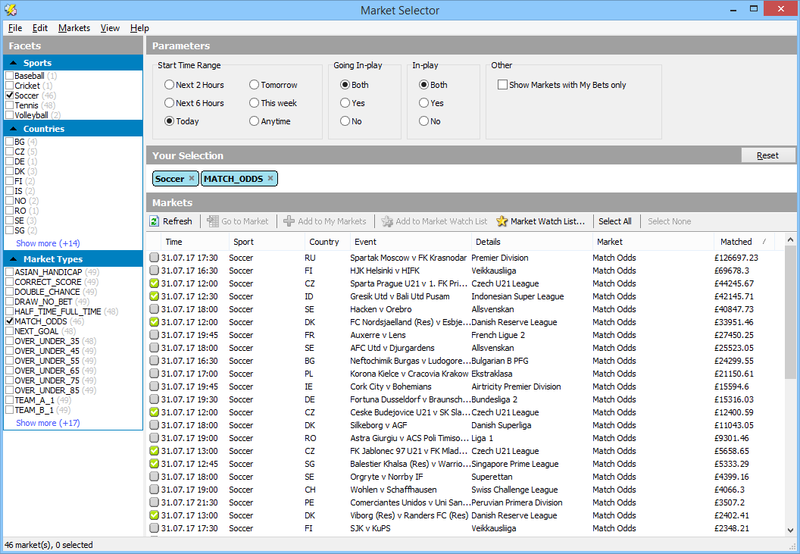 Then add the selected markets with a single mouse click to the "My Markets" menu or "Market Watch List" for easy access to these markets in the future.